The key domestic indices -- the S&P BSE Sensex and NSE Nifty50 -- gained over 1.50% on the back of value buying by investors on Monday. 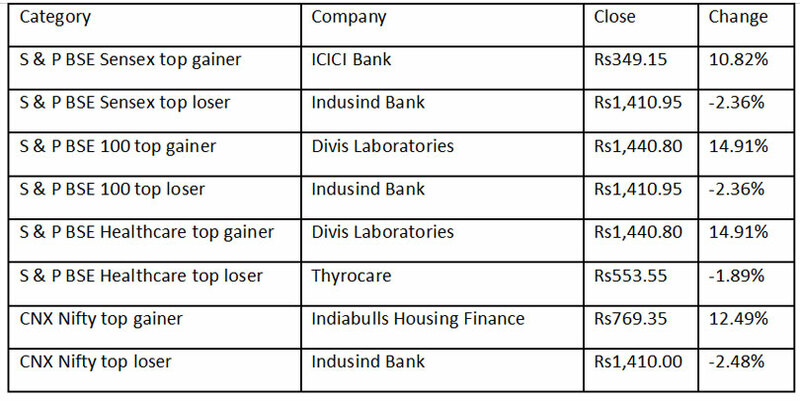 All the 19 sectors on the BSE gained, with banking and finance counters leading. Gains were witnessed in export-oriented stocks like healthcare and IT (information technology) counters. Sundram Fasteners reported Q2 FY19 standalone results of total revenue at Rs1,001.61 crore (Rs818.45 crore), up 22.4% year-on-year. Profit after tax was at Rs110.22 crore (Rs90.43 crore), up 21.9% year-on-year. Earnings per shares were at Rs5.25 (Rs4.30). Interim dividend of Rs2.00 per share was declared. The company’s shares closed at Rs519.00, up 0.09% on the BSE. Century Textiles reported Q2 FY19 standalone results which included Income from operations at Rs2,088.89 crore (Rs1,821.69 crore), up 14.7% year-on-year. Net profit was at Rs156.52 crore (Rs52.78 crore), up 196.6% year-on-year. Earnings per share were at Rs14.01 (Rs4.72). Century Textiles shares closed at Rs805.15, up 4.40% on the NSE. Prakash Industries reported Q2 FY19 standalone results of net revenues at Rs950.31 crore (Rs647.92 crore), up 46.7% year-on-year. Profit after tax was at Rs130.73 crore (Rs71.06 crore), up 84% year-on-year. Earnings per share were at Rs8.03 (Rs4.69). The company’s shares closed at Rs104.55, up 3.46% on the NSE. Vijaya Bank reported Q2 FY19 results including, net interest income (NII) at Rs1,165.52 crore (Rs1,008.40 crore), up 15.6% year-on-year. Net Profit was at Rs139.94 crore (Rs185.46 crore), down 24.5% year-on-year. Provisions were at Rs488.21 crore (Rs449.65 crore). Gross non-performing assets (GNPA) were at 5.86% (7.06%). Net non-performing assets (NNPA) were at 3.81% (4.86%). Vijaya Bank shares closed at Rs43.15, up 6.15% on the NSE. Alphageo received Notification of Award of Contract from ONGC, NSP Project, Mumbai for provision of 2D Seismic Data Acquisition services in un-appraised on land areas of Sedimentary Basins of Ganga-Punjab Area for estimated Contract Value of Rs33.89 crore. Alphageo shares closed at Rs484.00, up 1.83% on the NSE. Cipla received final approval for its ANDA for Metoprolol ER Tablets USP, from the US FDA (United States of America). The drug is a generic version Aralez Pharma’s, Toprol XL® which is indicated for the treatment of hypertension. Cipla shares closed at Rs633.00, up 4.85% on the NSE. Nestle India reported Q2 FY19 results of revenue at Rs2,939.3 crore (Rs2,514 crore), up 16.9% year-on-year. Profit after tax was at Rs446.1 crore (Rs343.1 crore), up 30% year-on-year. Earnings per share were at Rs46.27 (Rs35.59). Nestle India shares closed at Rs9,646.00, up 0.80% on the NSE. HDFC Bank has been set to acquire 4.95% equity stake in NSDL for a cash consideration of Rs163.34 crore at a price of Rs825 per equity share. The bank’s shares closed at Rs1,929.90, down 1.60% on the NSE. ICICI Bank reported Q2FY19 results including net interest income (NII) at Rs6,417.58 crore (Rs5,709.07 crore), up 12.4% year-on-year. Net profit was at Rs908.88 crore (Rs2058.19 crore), down 55.8% year-on-year. Provisions were at Rs3,994.29 crore (Rs4,502.93 crore). Gross non-performing assets (GNPA) were at 8.54% (7.87%). Net non-performing assets (NNPA) were at 3.65% (4.43%). ICICI Bank shares closed at Rs351.45, up 11.34% on the NSE. Atul Ltd reported Q2 FY19 standalone results of revenue at Rs1,007.42 crore (Rs787.25 crore), up 28% year-on-year. Net profit was at Rs119.02 crore (Rs70.07 crore), up 69.9% year-on-year. Earnings per share were at Rs40.13 (Rs23.62). Atul shares closed at Rs3,290.00, up 2.16% on the NSE. Indian Overseas Bank reported Q2 FY19 standalone results of net interest income (NII) at Rs1,208.31 crore (Rs1,520.38 crore), down 20.50% year-on-year. Loss of Rs487.26 crore was reported (loss of Rs1,222.50 crore). Provisions were at Rs2,016.60 crore (Rs2,238.09 crore). Gross non-performing assets (GNPA) were at 24.73% (22.73%). Net non-performing assets (NNPA) were at 14.34% (13.86%). Indian Overseas Bank shares closed at Rs14.40, up 3.23% on the NSE.